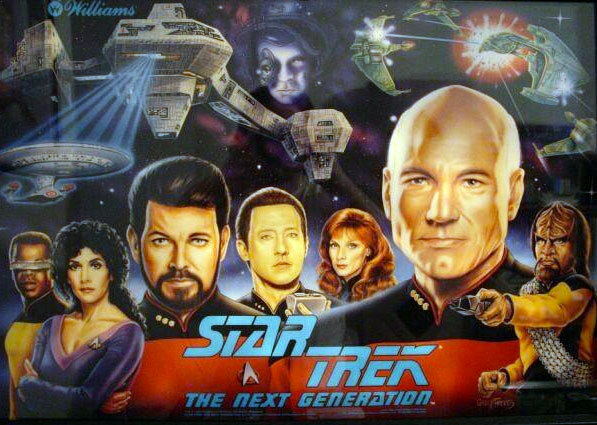 Star Trek: The Next Generation is a widebody pinball game, designed by Steve Ritchie and released in November 1993 by Williams Electronics. It was part of WMS’ SuperPin series (see also The Twilight Zone and Indiana Jones: The Pinball Adventure), and was based on the TV series. 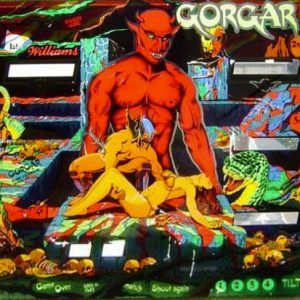 It is the only pinball machine that features three separate highscore-lists. 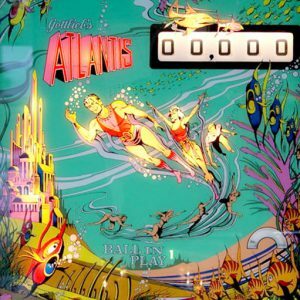 Apart from the regular highscore-list and the buy-in-list, it also features a reminiscence to The Machine: Bride of Pin*Bot billionaires club. It is also the third pinball game overall based on the Star Trek franchise, following the 1979 pinball game by Bally, and the 1991 game by Data East (both based on the original series). When a new ball is launched into the plunger, the player is given one of five launch awards, which is selected when the ball is fired. Unless otherwise noted, the ball is launched through the spiral ramp and into the lock hole (above the pop bumpers). Another ball is popped from the left scoop and onto the left inlanes. Start Mission: Starts lit mission. Flipper Skill Shot: The player has to shoot the ball up the right ramp (the Beta Quadrant) for a random award. Launch Probe: The ball will be loaded into one of the two cannons, located on top of the slings. Shoot the lit target for a random award. If the player misses, Data will say, “The probe has discovered nothing, sir”. Light Lock / Light Holodeck: Lights the ball lock, and the ball gets locked for multiball. When this option is selected twice, “Light Lock” changes to “Light Holodeck”. Warp Factor: Starts the ball at Warp Factor 4. After the player reaches Warp 9, (depending on the ROM version), the award changes to Warp 9.1, up to 9.9 (the player has only a limited amount of time to make either the left circle or Delta ramp for each point), then changes to “Warp Factor 2″. The ball is sent to the pop bumpers. Explosive Millions – Shooting the Alpha Quadrant or Beta Quadrant ramps unlocks Explosive Millions. Shooting the same or opposite ramp awards 5 million points, followed by 10 million for another shot, which cumuliates by 10 million every shot. The player has ten seconds to hit the ramp to score or the mode ends. Holodeck – The player has two choices. Score 25 million points, or play the “video mode” shuttle cavern. If the player selects the video mode, the player has to go through the caverns in a shuttle, picking up 10 million point cards while avoiding mines and cavern walls. There is an extra ball card somewhere in the caverns, as well as artifact (see below). Reaching the Extra Ball is achieved by alternating Left, Left, Right, Right turns until cavern 7. 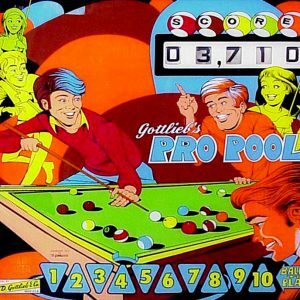 Depending on how many Extra Balls have already been earned and the games Extra Ball probability configuration it may end up either an Extra Ball or a 10 million point card. Once an Extra Ball has been earned in the Holodeck all subsequent Holodeck runs will not award any Extra Balls, regardless of the path chosen. Collecting the artifact, clearing all caverns, or crashing into a mine or wall immediately ends the video mode scoring the points collected in the mode. A maximum score of 159 million points is possible for a flawless run. At the start of the Holodeck mode, pressing a flipper button along with pulling the launch trigger starts a “Riker’s Poker Night” video mode. Kickback – Shooting the three left yellow targets lights Kickback, which saves the ball from draining from the left outlane. If the game is in tournament mode this must initially be earned. Otherwise the game starts out with the Kickback lit. The Kickback can be recharged unlimited times by hitting the appropriate targets after it had been depleted. Shuttle Ramp – Each shot at the Beta Quadrant Ramp launches a shuttle which a certain number of launched shuttles can reward a player. Rewards could be Light Holodeck, Command Decision, or Extra Balls. Between the ramps are two small targets when hit, adds two times the shuttle to the counter.